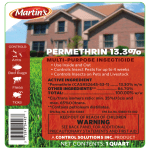 BEDBUGS, MOTHS, ANTS, SPIDERS, AND MORE. *Cis/trans isomers ratio: min. 35% (±) cis and max. 65% (±) trans. NOTE TO PHYSICIAN: Contains petroleum distillate - vomiting may cause aspiration pneumonia. swallowed. Avoid breathing vapor. Wash thoroughly after handling. For space spraying indoors wear a dust/mist filtering respirator (MSHA/NIOSH approval number prefix TC-21C) or a NIOSH approved respirator with any R, P or HE filter. over the treated area will help avoid run off to water bodies or drainage systems. Combustible! Do not use or store near heat or open flame. Flashpoint minimum of 105°F (41°C). product to enter any drain during or after application. stables. In horse stables, not for application if horses will be used for food. (cleaning, slicing, cooking, grinding), edible waste storage, enclosed processing systems (mills, dairies, edible oils, syrups). are present in the immediate area. For heavy infestations, use the 0.50% dilution. For lighter infestations and for maintenance purposes, use the 0.25% dilution. One gallon of finished spray is sufficient to treat 1,580 linear feet with a 6 inch spray band. and storage areas. 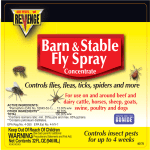 Spray directly on insects where possible. use. Do not apply to pillows or bed linens. Spiders: Spray directly on these pests and to the webbing and all cracks and crevices which harbor spiders. Ants: To kill ants, spray trails, nests and points of entry within buildings and homes. Spray directly on ants where possible. Wasps, Hornets, Yellow Jackets, Bees, Indoors: Application should be made in the late evening when insects are at rest. 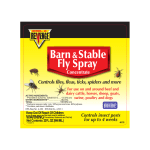 Spray liberally into hiding and breeding places, especially under attic rafters, contacting as many insects as possible. upward. Direct spray mist to all parts of the room, especially windows and other light sources which may attract these insects. room. Ventilated the room when treatment is completed. pests congregate or have been seen. 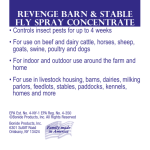 not apply this pesticide when people, pets and food are present. Do not use in an evaporative cooling system. pesticide when people, pets and food are present is prohibited. 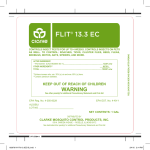 the end use pesticide label and a dilution statement to the system reservoir tank in a weather protected area or plastic sleeve. The dilution statement must be stated as follows: This container holds 1 part FLIT 13.3 EC to 21 parts water. container in a weather protected area or plastic sleeve. thoroughly wet hills and runways. Wasps, Hornets, Yellow Jackets, Bees, Outdoors: Application should be made in late evening when insects are at rest. and contacting as many insects as possible. cubic feet of space. Set timer to operate in accordance with equipment directions. deliver the diluted product as a gentle rain at the rate of 1 gallon per mound is still required. Do not use equipment that produces a pressurized spray as pressurized sprays may disturb fire ants and cause migration, reducing product effectiveness. call 1-800-548-2423 (Animal Poison Control Center). 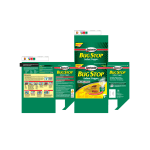 Pesticide Storage: Store and transport in an upright position. Store in a cool dry area inaccessible to children or pets. product down any indoor or outdoor drain. Dilute 8 oz. in 8.25 gal. water. Dilute 1 pt. in 16.5 gal. water. Dilute 1 qt. in 33 gal. water. tick. 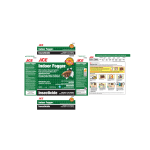 Aids in control of cockroaches, mosquitoes and spiders. Spray walls and surfaces to the point of runoff, about 1 gal. PESTS ON DOG PREMISES (Kennels, Dog Houses, Runs and Yards); fleas, flies, lice and mange mites (adult and larvae). levels, but accompanying manure removal and sanitation practices should precede sprays. Do not spray feed, food, or water. Repeat as needed but not more often than once every two weeks. consistent with applicable law, Seller shall give no liability for consequential damages. the National Pesticide Information Center at 1-800-858-7378.